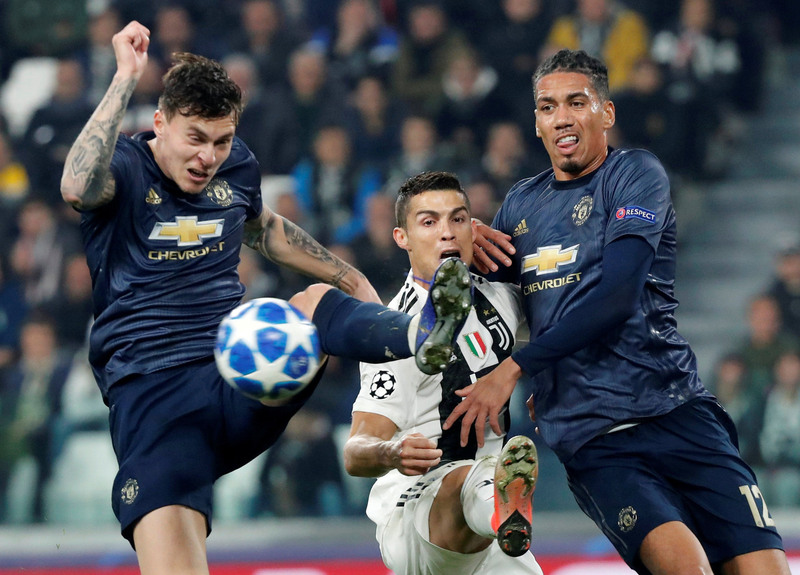 GENEVA - It was Manchester’s night in the Champions League as United stunned Juventus with late goals and City routed Shakhtar Donetsk on Wednesday. Cristiano Ronaldo’s brilliant goal — a volley from a long pass that dropped into his path over his right shoulder — was set to give Juventus victory against his former club with minutes to play in Turin, Italy. Manchester United hit back through Juan Mata’s free kick and a scrambled own goal from a cross that bounced into the net off two defenders on the line for a 2-1 win. Juventus players Leonardo Bonucci and Paulo Dybala confronted Manchester United coach Jose Mourinho with United captain Ashley Young intervening as Mourinho was led off the pitch by a UEFA official. It’s now three straight wins in all competitions for Madrid since coach Julen Lopetegui was fired and Santiago Solari took over. The Group E table has a 1970s feel with Bayern Munich and Ajax looking good to advance. The teams each won a hat trick of European Cup titles from 1971 to ’76.